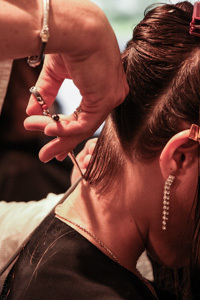 Our professional staff offers a wide variety of expert coloring and highlighting services. 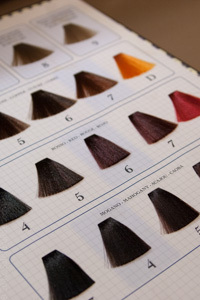 To achieve the most beautiful blonds, vibrant reds, and gorgeous brunettes we use top quality professional color lines. Schedule a complimentary consultation to discuss your hair color goals and develop a plan with your colorist to reach your objectives. Service includes personalized consultation, custom color formulation and application, luxurious cleansing and conditioning hair bath, and salon blow-out style. A single process color creates one smooth gleaming color from roots to ends and offers coverage of any and all natural pigments of the hair. Color is matched and applied to new growth area to blend with previously colored hair. Lighter or darker shades of color add dimension to a single color service. Balayage is a French coloring technique that utilizes a freehand painting application. This modern technique can offer a more natural sun-kissed or caramelized look to highlighting hair. From beautiful natural shimmer, to a strong statement of color, balayage will add dimension and depth to your style. Ombre hair color is generally darker at the roots through the mid-shaft and then gets lighter from the mid-shaft to the ends. With a Full Highlight, highlights are placed evenly through out the entire head. This application is usually used to create a blonding effect.